Blueboat Hostel Myeongdong i Seoul, Sydkorea : Boka nu! 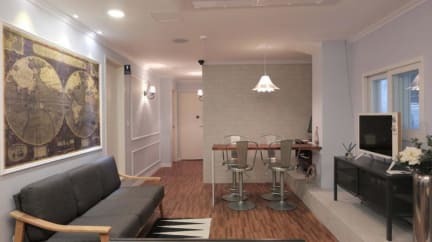 If what you're looking for is a conveniently located hotsel in Seoul, look no further than Blueboat Hostel Myeongdong. 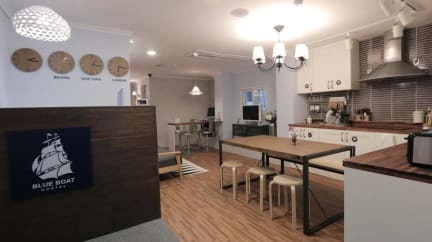 Situated in the heart of Seoul, Blueboat Hostel Myeongdong provides guests with easy access to all the scenic spots that the lovely city has to offer. Offering quality accommodation, Blueboat Hostel Myeongdong is a popular choice for business and leisure travellers. All the staffs of Blueboat Hostel are working with their best effort to make your trip more comfortable and pleasant. If you have planned to visit Seoul, do not hesitate to come to Blue Boat Hostel and make unforgettable memories with your family and or companions. (1) 2nd and 4th floor is opened to all genders while 3rd floor is only for women with all rooms well protected by enhanced security lock system. (2) The rooms at 2nd and 4th floor are opened to all genders but you can't share room with different gender with the exception of your family members. 1. Check in from 2pm and check out until 11am. 2. Cash only upon arrival. At least a 3-day advance notice before the arrival date is required for cancellation free of charge. In case of late cancellation or No Show, the full amount will be charged. 4. Minimum age of guests to live in is 4 year(s). 5. Guests over 4 years old are considered as adults.